When we decided on getting married in Cyprus, we didn’t really know where to start. We did some research on Google and came across Stella Virdi’s website so we emailed her to ask for further details. Despite the fact she was on holiday herself, she got back to us very quickly and we immediately got a good feel about her efficiency and personality. 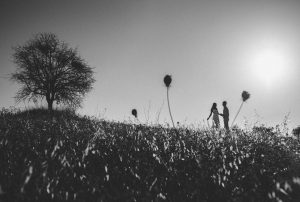 Our wedding was very small, just the two of us, and I was slightly concerned that a wedding so small wouldn’t really be her priority, we were wrong! From the very first correspondence we had with her, she made it clear that our wedding was just as important as a big wedding with multiple guests. She gave us great advice on everything we needed to do in advance of the big day, including a sample affidavit which ended up saving us quite a lot of money because we were able to create our own and just get them verified by a solicitor. She arranged to pick us up from our villa in Paphos to submit our wedding licence at the town hall a few days before the wedding and it all went incredibly smoothly – we were in and out within minutes! On the big day, she had arranged for a fabulous woman to come and do my hair and make up and she personally brought the flowers we had chosen to us and she helped to get me in to my dress which was a wonderful help. She took photos of us so we could share them with people back home and drove us to the ceremony. She was also our witness! She arranged for a great photographer to attend the ceremony who immediately put us at ease, not an easy task with a photo phobic couple! We honestly can’t thank Stella Virdi enough for everything she did for us. If you’re after an efficient but incredibly friendly wedding planner who doesn’t leave you hanging waiting for responses to emails, she is your woman! I wouldn’t hesitate in recommending her and her team to help you with your big day. 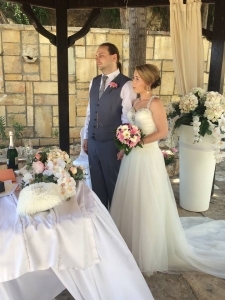 Posted on May 14, 2017 Author Stella VirdiCategories Cyprus Wedding NewsTags Elope to Cyprus, Love and weddings in Cyprus, Poem by Jasmine Virdi, Stella Virdi Perfect Planner, wedding planner recommended. To the one that anchored me when sailing through rough waters. To the one that was my lighthouse when I found myself lost in the dark and lonesome ocean.